French Foreign Minister Dominique de Villepin has said France is ready to evacuate its nationals from Ivory Coast, after violent protests sparked by a peace agreement aimed at ending the country's four-month-old civil war. The deal, signed in France on Saturday, stipulates that supporters of President Laurent Gbagbo should share power with rebels within a unity government. But in a letter to the president, the army says it will not accept the rebels taking over the defence and interior ministries, which the rebels say has been agreed. Mr Gbagbo has yet to address the nation to explain the deal, which sparked fresh anti-French protests on Tuesday. Both the commercial capital, Abidjan, and Agboville, the scene of ethnic clashes on Tuesday, are now reported to be calm. Mr de Villepin said that the 2,500 troops, initially deployed in Ivory Coast to monitor the ceasefire and protect western nationals, could proceed with an evacuation at short notice. "Our soldiers in the area are able to do it very quickly," he told French RTL radio. "Of course, we are following the situation hour by hour and we will not hesitate to take such a decision if the situation requires it." 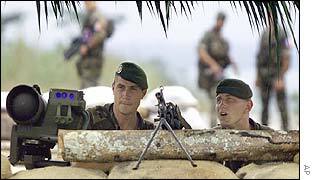 The BBC's Mark Doyle says that diverting French troops from holding the ceasefire line to evacuating the 15,000 to 20,000 French nationals in Ivory Coast could endanger President Gbagbo's military position. Mr de Villepin hinted that Mr Gbagbo's keenly awaited address to the nation, which is now expected to take place on Wednesday evening, would be crucial in determining the outcome of the crisis. "Today everything depends on the political courage of the Ivorian leaders. An agreement has been reached." Senior military officers met Mr Gbagbo to express their objections. "We told him officially that the army does not agree with certain elements of the peace agreement," army spokesman Jules Yao Yao said. Mr Gbagbo said at the weekend that the claims by the rebels that they would get the defence and interior portfolios were just rumours. And Interior Minister Paul Yao N'dre is now reported to have said in a speech on Togolese television that the deal was now "null and void". Former President Henri Konan Bedie has also said that the rebels should not be given the defence and interior portfolios. "These are decisions that were taken by the heads of state, by the great powers, to be more precise. The Ivorian political parties did not have their say in the matter," said the current leader of the former ruling Ivory Coast Democratic Party. The BBC's Tom McKinley in Ivory Coast says the army's opposition puts the president in a seemingly impossible position. On Saturday Mr Gbagbo agreed to share power with the rebels - but without the support of his army he cannot keep his word. On Tuesday, protests in Abidjan, were mostly peaceful, but in Agboville, 80km (50 miles) to the north, an anti-French demonstration developed into a clash between armed members of the local Abbey ethnic group and Dioulas, a Muslim group from the north. The main rebel group is drawn from the Muslim north, while President Gbagbo's power base is in the Christian south. Churches and mosques were burnt in Agboville, and as many as 12 people are thought to have been killed. In the wake of the protests, the rebels have accused Mr Gbagbo of being two-faced. "I must say we are not surprised by this double game and the doublespeak because we knew he would call these accords into question," one of the rebel leaders, Guillaume Soro, said. Air France announced on Tuesday that it was suspending all its flights to Abidjan and streamlining its staff there. In the recent demonstrations, Mr Gbagbo's supporters have attacked French targets, including its embassy and a military base, and have asked the United States to intervene on their behalf. "Pro-government demonstrators have accused France of pushing the rebel cause"